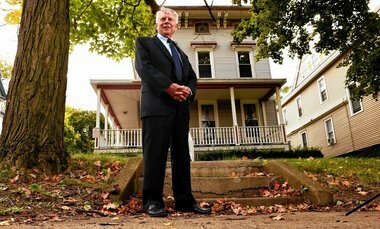 SYRACUSE, NY — Kenyon Craig, the 80-year-old visionary behind Housing Visions, is stepping down as president and CEO after 27 years during which the neighborhood revitalization group grew from a church committee into the owner of nearly 1,600 affordable housing units in 15 communities. Housing Vision’s former chief operating officer, Rebecca C. Newman, will replace Craig at the helm, the nonprofit organization announced Wednesday. Craig will stay on as vice president for strategic planning. Craig co-founded Housing Visions in 1990, after his church group at University United Methodist Church decided to do something about run-down housing in the East Genesee Street area of Syracuse. Craig, then 52, quit his job at mall developer The Pyramid Cos. to spearhead the effort. The group started out with a project to renovate three blighted apartment houses. Craig successfully financed the project with low-income housing tax credits, which were new at the time. Housing Visions grew steadily, renovating entire neighborhoods in Syracuse, then expanding to other cities in Upstate New York and Pennsylvania. The organization now has its own construction and property management divisions. In 2009, Craig launched Visions for Change, a nonprofit affiliate of Housing Visions, to provide job counseling and education. Ken Craig transformed a group of church volunteers into a 100-person housing organization that has undertaken $300 million in renovations. Newman, 36, has worked at Housing Visions since 2006. For the past four years, she served as executive vice president and chief operating officer. Newman was most recently responsible for a successful restructuring of the organization’s construction division, which included an overhaul of staffing, bidding, and management processes. Newman holds bachelor’s degrees in economics and public policy law from Hobart & William Smith Colleges.